Once it was difficult to see end of life care beyond conventional medical intervention, but hospice and palliative care introduced a more holistic approach, providing quality of life for the dying and their families. This ground-breaking work takes end-of-life care beyond these palliative boundaries, describing a public health vision that involves whole communities adopting a compassionate approach to dying, death and loss. 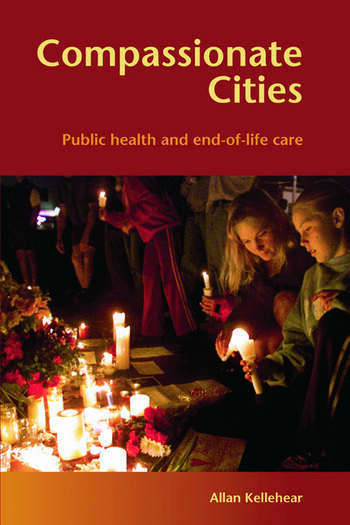 Written by a leading academic in the field of death and bereavement, this text outlines the historical, political and conceptual basis of compassionate cities, providing a community development model for end-of-life care. Moving away from infection control and health promotion Allan Kellehear invites us to think of a third wave movement of public health, joining empathy, equality and action together as practical policies. Presenting a radical new perspective to death, ageing and public health, Compassionate Cities is essential reading for academics and professionals alike. Allan Kellehear is Professor of Palliative Care, and Director of the Palliative Care Unit, at La Trobe University, Australia.